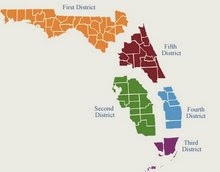 The Florida Legal Blog: Fifth District On Assignment Of PIP Benefits And Possible Intra-District Conflict Regarding § 627.428(1), Fla. Stat. Fifth District On Assignment Of PIP Benefits And Possible Intra-District Conflict Regarding § 627.428(1), Fla. Stat. In Progressive Express Insurance Co. v. Hartley (5D09-750), the Fifth District denied Progressive's request for second tier certiorari review. Progressive issued a policy of insurance to Hartley that provided personal injury protection (PIP) benefits. On March 18, 2003, while this policy was in effect, Hartley was involved in a motor vehicle accident in which he suffered personal injuries. Hartley received medical treatment for his injuries from Michael C. Durant, D.C. Upon seeking treatment from Dr. Durant, Hartley executed an assignment of PIP benefits to "Atlantic Coast Chiropractic Clinic." Dr. Durant submitted claims for payment of PIP benefits to Progressive for treatment under the name "Durant Chiropractic Clinic." Progressive paid some claims and disallowed others submitted for Hartley's treatment. In November 2003, Dr. Durant executed a document which purported to reassign and transfer to Hartley any and all causes of actions against any insurer to recover PIP benefits. It was Progressive's position that the purported reassignment of benefits to Hartley from Dr. Durant was ineffective because the original assignment of benefits had been to a corporate entity, not Dr. Durant. The county court agreed and granted Progressive's motion. The circuit court reversed, finding that the initial purported assignment of Hartley to "Atlantic Coast Chiropractic Clinic" was invalid because that entity did not exist in 2003 (and apparently at no time thereafter). Therefore, the circuit court concluded that Hartley had retained his right to claim PIP benefits due under his insurance policy. Progressive contends that pursuant to section 865.09(9)(b), the initial assignment was valid. That section provides that the failure of a business to comply with the fictitious name registration statute does not impair the validity of any contract of such business. While that section may have supported Progressive's argument if the initial assignment was to Durant Chiropractic Clinic, Inc., d/b/a Atlantic Coast Chiropractic Clinic (notwithstanding a failure to comply with the fictitious name registration statute), it provides no relief to Progressive in the instant case. The fact remains that the assignment was made to a non-existent entity. "Given the courts' narrow interpretation of the language of section 627.428, it appears that this Court is not authorized to grant fees to an insured who does not succeed in his or her application for certiorari. Indeed, it is doubtful that an insured would even be entitled to fees for a certiorari proceeding in which it prevails based on the interpretation of the statute that appellate courts are authorized to award fees only for an appeal that the insured wins."